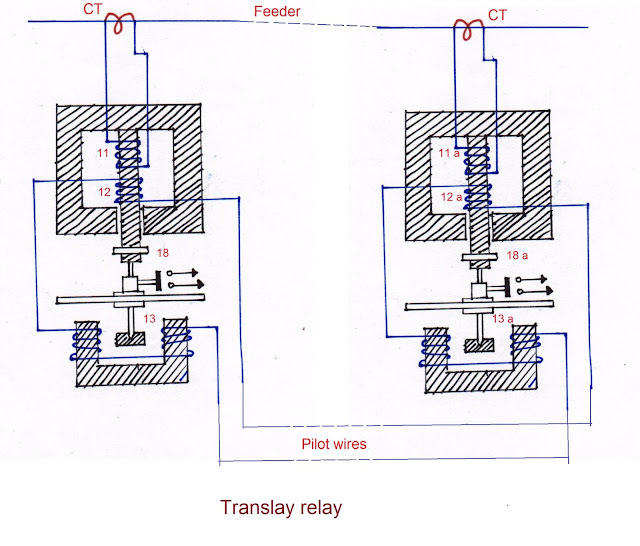 The name "Translay is evolved from the fact that the relay embodies a transformer feature. This system can be employed for protection of single or 3-phase feeders, transformer feeder, feeders with tee-off and parallel feeders against both earth and phase faults. This system is based on the established principle of the current entering at one end of the feeder being equal at any instant to that leaving at the other end. 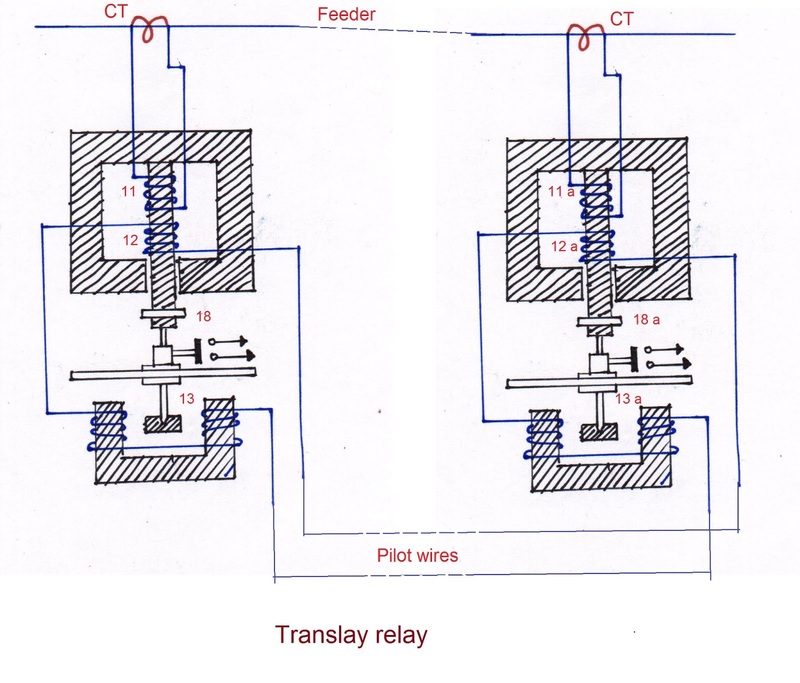 The translay relay employed is quite similar in construction to an overcurrent induction type relay. Translay protection system is modified form of voltage-balance system, Although the principle of balanced voltages is retained, it differs from the above voltage balance system in that the balance or opposition is between voltages induced in the secondary coils wound on the relay magnets and not between the secondary voltages of the line transformers. Since the current transformers used with translay relay scheme have only to supply to a relay coil, they can be made of normal design without any air gaps. This permits the scheme to be used for feeders of any voltage. The figure shows the simplified diagram illustrating the principle of translay scheme. It consists of two identical double winding induction type relays fitted at either end of the feeder to be protected. The primary circuits 11, 11a of these relays are supplied through a pair of current transformers. The secondary windings 12, 13 and 12a, 13a of the two relays are connected in series by pilot wires in such a way that voltages induced in the former opposes the other. The compensating devices neutralise the effects of pilot-wire capacitance currents and of inherent lack of balance between the two current transformers. Under healthy conditions, current at the two ends of the protected feeder is the same and the primary windings of the relays carry the same current. The windings 11 and 11a induce equal e.m.f's in the secondary windings 12, 12a and 13, 13a. As these windings are so connected that their induced voltages are in opposition, no current will flow through the pilots or operation coils and hence no torque will be exerted on the disc of either relay. In the event of fault on the protected feeder, current leaving the feeder will differ from the current entering the feeder. Consequently, unequal voltages will be induced in the secondary windings of the relays and current will circulate between the two windings, causing the torque to be exerted on the disc of each relay. As the direction of secondary current will be opposite in the two relays, therefore, the torque in one relay will tend to close the trip circuit while in the other relay, the torque will hold the movement in the normal unoperated position. It may be noted that resulting operating torque depends upon the position and nature of the fault in the protected zone and atleast one element of either relay will operate under any fault condition. The role of closed copper rings 18 and 18a is to neutralise the effects of pilot capacitive currents. Capacitive currents lead the voltage impressed across the pilots by 90°; and when they flow in the operating winding 13 and 13a, they produce fluxes that also lead the pilot voltage by 90°. Since pilot voltage is that induced in the secondary windings 12 and 12a, it lags by a substantial angle behind the fluxes in the field magnet air gaps A and B. The closed copper rings are so adjusted that this angle is approximately 90°. In this way fluxes acting on the disc are in phase and hence no torque is exerted on the relay disc. Advantages of Translay relay system over Merz-Price system. The capacitance currents do not affect the relay operation. Only two pilot wires are required. Current transformers of normal designs can be used. The closed copper loop provided in the relay prevents the relay from operating for through fault current.